Postać - Droid. Punkty: 8/11. Wytrzymałość: 8. 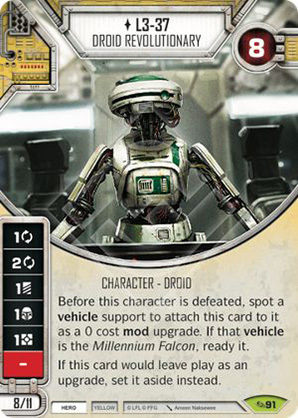 Before this character is defeated, spot a vehicle support to attach this card to it as a 0 cost mod upgrade. If that vehicle is the Millennium Falcon, ready it. If this card would leave play as an upgrade, set it aside instead.